Container for a workbook (collection of tables) backed by any kind of spreadsheet or database. Definition at line 21 of file PolyBook.h. Definition at line 26 of file PolyBook.h. Definition at line 30 of file PolyBook.h. Definition at line 60 of file PolyBook.h. Referenced by attach(), coopy::fold::FoldedCell::FoldedCell(), coopy::fold::FoldedCell::getOrCreateSheet(), operator=(), coopy::store::PolyValue::operator=(), coopy::store::PolySheet::operator=(), coopy::fold::FoldedCell::operator=(), PolyBook(), coopy::store::PolySheet::PolySheet(), coopy::store::PolyValue::PolyValue(), coopy::store::PolySheet::setSchema(), and take(). Referenced by coopy::app::Diff::apply(), attachReadWrite(), generateExample(), main(), read(), readAndWillWrite(), readIfExists(), and write(). Referenced by coopy::app::Options::apply(), operator=(), take(), and ~PolyBook(). Referenced by getType(), and readAndWillWrite(). Definition at line 76 of file PolyBook.h. Referenced by coopy::app::Diff::apply(), coopy::fold::FoldTool::fold(), getSheetCount(), main(), and coopy::fold::FoldTool::unfold(). References expand(), NULL, and coopy::store::Property::put(). Definition at line 67 of file PolyBook.h. References attach(), NULL, and coopy::store::Property::put(). Referenced by WideSheetManager::acceptSheet(), coopy::app::Options::apply(), coopy::app::Diff::apply(), copyFile(), WideSheetManager::diffSheet(), WideSheetManager::exportSheet(), coopy::app::Coopy::loadBook(), main(), WideSheetManager::mergeToLocal(), and readForReference(). References attach(), expand(), coopy::store::Property::nest(), NULL, and coopy::store::Property::put(). Referenced by clear(), coopy::store::PolyValue::clear(), coopy::store::PolySheet::clearSchema(), coopy::store::PolySheet::clearSheet(), and give(). 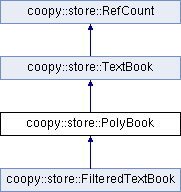 Referenced by coopy::app::Diff::apply(), coopy::app::Coopy::createBook(), csvs_diff(), coopy::store::FilteredTextBook::FilteredTextBook(), coopy::fold::FoldTool::fold(), and generateExample(). Referenced by WideSheetManager::acceptSheet(), coopy::app::Diff::apply(), copyBook(), copyFile(), WideSheetManager::exportSheet(), generateExample(), and WideSheetManager::mergeToLocal().